Today we know Sir Thomas More primarily as the author of Utopia, and as one of the more famous martyrs of Henry VIII’s reign. The popular image is of a man – principled, steadfast, courageous – who placed his own conscience above his king’s demands. Yet if you were to ask More’s contemporaries to describe him, their words would be as conflicted and contradictory as the man himself. He was a brilliant scholar of the Renaissance who died rather than betray the Catholic church. As a young man, he seriously contemplated joining the priesthood, only to become one of the most successful politicians of his time. And he was a father who insisted his three daughters have the same education as his son. Perhaps more than any other courtier of Henry’s reign, More embodied the searching, troubled spirit of the early 16th century. More’s beginnings, however, hardly predicted his spectacular career. In Utopia, he identified himself as a “citizen of London”, and it was in London that he was born on 7 February 1477, the only surviving son of John More and his first wife, Agnes Graunger. John More was a successful lawyer who was later knighted and made a judge of the King’s Bench; he was prosperous enough to send his son to London’s best school, St Anthony’s at Threadneedle Street. And he was well-connected enough to later secure his son’s appointment as household page to John Morton, the archbishop of Canterbury and Lord Chancellor of England. There is an apocryphal story that Morton predicted his bright and lively page would grow into a “marvelous man”. More’s adolescent years were spent under the reign of Henry VII, the first Tudor king. And his patron Morton was infamous as the architect of that king’s very successful – and subsequently very unpopular – tax policy. Morton’s tax philosophy was a marvel of inescapable logic: “If the subject is seen to live frugally, tell him because he is clearly a money saver of great ability, he can afford to give generously to the King. If, however, the subject lives a life of great extravagance, tell him he, too, can afford to give largely, the proof of his opulence being evident in his expenditure.” And while this reasoning worked to replenish the royal treasury for Henry VII, it also provided the second Tudor king with a chance to curry popular favor when he – in one of his first acts as Henry VIII – imprisoned and later executed Edmund Dudley and Richard Empson, who were Morton’s (and his father’s) tax collectors. However, we should not assume that Morton’s politics had any profound impact upon More. Quite the opposite. Both men were enthusiastic Humanist scholars, but they parted ways with regard to the king’s prerogative. In 1504, More was elected to Parliament and one of his first acts was to oppose Henry VII’s request of a “grant” of three-fifteenths. It was More’s impassioned speeches against this large and unjust burden that made the king reduce it by more than two thirds. And the king was not pleased with the young lawyer; he promptly imprisoned More’s father in the Tower until he paid a substantial fine. That was the beginning of Thomas More’s public career, and it was a telling one. More’s connection to Morton had earlier secured him admittance to Oxford, where he studied for two years, mastering Greek and Latin with “an instinct of genius”, and studying a wide variety of subjects, including music. His father recalled him to London and he trained as a law student at New Inn and later Lincoln’s Inn. The governors of Lincoln admired him enough to appoint him lecturer on law for three consecutive years. More’s brilliance of mind and curious, kindly character gained him many friends and admirers. Yet even as his legal future seemed assured, More was deeply conflicted about his future. He had long felt a calling to the priesthood. Now he decided to seriously test his religious convictions. It should be noted that More’s affinity for the monastic life never left him, despite his later marriages, family, and career. Even as he secretly wore a hair shirt, he openly and consistently fasted, prayed, and maintained a relatively modest household. When he later built his ‘Great House’ in Chelsea, its rooms were specifically designed to encourage quiet study and prayer. More’s piety was the defining aspect of his character; even as the circumstances of his life changed, it remained constant and unyielding. His decision to become a lay Christian now made, More quickly married. His choice was Jane Colt, the eldest daughter of a gentleman farmer. His son-in-law William Roper, whose biography of More is one of the first biographies ever written, tells us that More chose his wife out of pity: “[A]lbeit his mind most served him to the second daughter, for that he thought her the fairest and best favored, yet when he considered that it would be great grief and some shame also to the eldest to see her younger sister preferred before her in marriage, he then, of a certain pity, framed his fancy towards” Jane. True or not, the marriage proved to be happy and fruitful, though of brief duration. After bearing More three daughters (Margaret, Elizabeth, Cicely) and one son (John), Jane died in 1511. More later memorialized her as “uxorcula Thomae Mori”; her gentle personality is attested to by Erasmus’s letters, as he was a frequent visitor to More’s home. The two men had first met in 1497 and remained close friends until More’s death. More’s wife had been – like most women of her time – ill-educated, and during their brief marriage, he taught her Latin and other subjects. She was an apt enough pupil to later converse with visitors in Latin. And More determined that their daughters would receive the same education as their son. The symbolism and importance of this decision cannot be underestimated. More’s eldest daughter Margaret would become the first non-royal Englishwoman to publish a work in translation. More was thus in his early thirties, successful, happily married, when the tax collectors Dudley and Empson were beheaded on Tower Hill at the command of the new king, Henry VIII. As a newly elected representative for London in Parliament and an undersheriff in the city, he was deeply involved in public life. He worked eight years as undersheriff and proved himself an impartial judge and able administrator. Contemporary chroniclers often referred to him as a friend of the poor. The one potentially scandalous act of his life was his quick second marriage to a widow seven years his senior, Alice Middleton. They married less than a month after Jane Colt’s death and More had to seek special dispensation from the church. It was granted, and the wealthy widow became stepmother to his four children, and More stepfather to her daughter and son. It proved to be another happy marriage, though More’s friends remarked upon Alice’s sharp tongue and occasionally brusque ways. Perhaps the contrast with the quiet, gentle Jane was too striking. For More’s part, he undoubtedly appreciated his second wife’s superb housekeeping skills for they allowed him the freedom to pursue his increasingly successful career. It is at this moment that we must step back and consider the England in which More now lived. There was a new king, – a handsome, athletic young man who had once been destined for the church. But his older brother perished and the younger brother was crowned at 18 years old, and quickly wed his brother’s widow. She was the Spanish princess, Katharine of Aragon, one of the daughters of the Catholic rulers of Spain. She was a devout and learned young woman, and though we primarily know her as the older wife who could not bear Henry his desired son and heir, she was once young and pretty and well-liked. Henry VIII’s later statements to the contrary, his marriage to Katharine began happily and continued so for some years. There was a feeling in England that a new era had begun. Henry VIII was a Catholic ruler, and enjoyed friendly relations with the papacy until he sought to divorce Katharine. But that was years in the future. As a young king, he was named “Defender of the Faith” by the pope for defending the church against Protestant heresy; his Lord Chancellor was Cardinal Thomas Wolsey. And because of his early education in religious matters, Henry was no mere spectator in religious debate. For these reasons, More had no cause to suspect his monarch of anything less than fealty to their shared faith. And as his own reputation grew in London, he attracted the notice of the all-powerful Cardinal Wolsey. In May 1515, More was sent to Bruges as part of a delegation arranged by Wolsey to revise an Anglo-Flemish commercial treaty. It was during this trip that he began to write Utopia, his most famous work. It was More who coined the term, a pun on the Greek words for ‘no place’ and ‘good place’. More had already begun writing his History of King Richard III as well; it is considered the first masterpiece of English history and is wholly pro-Tudor. Its influence upon William Shakespeare’s Richard III is immense. Utopia is a complex and witty work which describes a city-state ruled entirely by reason. It is meant to contrast with the reality of European rule, divided by ideologies and greed and self-interest. More essentially argued that communal life is the only way to end the ill effects of self-interest on politics. The work was a marvel of learning and wit and wholly original; it was soon translated throughout the Continent and its author hailed as one of the foremost Humanist thinkers. It is no exaggeration to state that its publication ensured More a stature that no other Englishman of his time enjoyed. Cardinal Wolsey – and the king – needed no further reason to bring More into the king’s service. His work at Bruges and, later, Calais, as well as his continuing duties as undersheriff in London, were clear evidence of his skill and popularity. More’s letters indicate that he was not particularly keen to enter royal service. This was not due to any dislike of the king. Rather, he felt that he could be more effective in the city itself, not closeted away amongst the nobles and councilors of Henry’s court. But polite prevarications only worked for so long and soon More was a genuine courtier, with all its attendant duties – and benefits. He was first appointed a Privy Councilor and accompanied Wolsey to an important diplomatic mission to Europe. He impressed the cardinal enough that he was knighted upon his return and made under-treasurer of the Exchequer. More importantly, he developed a personal relationship with Henry VIII, and because known as the king’s “intellectual courtier”. Soon he was acting as Henry’s personal secretary and adviser, delivering official speeches, greeting foreign envoys, drafting treaties and other public documents, and composing the king’s responses to Wolsey’s dispatches. More also engaged in a public war of words – on the king’s behalf – with Martin Luther, the father of the Reformation. In April 1523, he was elected speaker of the House of Commons. His position at court meant that he was to be the king’s advocate before parliament. But to More’s credit, he made an impassioned plea for greater freedom of speech in parliament. Such was his reputation that the the great universities – Oxford and Cambridge – made him high steward. His personal life remained placid and content. His eldest daughter Margaret married the lawyer William Roper in 1521, and More continued his practice of prayer and supervision of learning at his home. His home at Chelsea was as close as Tudor England would come to an 18th century French salon. Intellectuals from England and Europe visited; More was a generous and kind host. He collected books and rare objects, but he gave away his possessions freely as well. He had a true gift for friendship and inspired deep loyalty amongst his family and friends. Among his guests, in fact, was the king himself. He would arrive unbidden, to either eat with the family or walk in the garden with More, his arm slung casually about More’s shoulders. Despite such evidence of royal favor, it is likely that More chafed at his service to the king. He was no fool; he noted Wolsey’s great – and increasingly ostentatious – wealth. His natural piety was at odds with other courtiers, all of whom jockeyed ceaselessly for the king’s favor. Ironically, it was his own honesty and probity which ensured his continued service to Henry. We come now to the great event of Henry’s reign. By 1527, the king was in his mid-thirties, and his wife six years older. The queen had suffered a series of miscarriages throughout their marriage; their only surviving child was the Princess Mary. Henry needed a son and heir. He had an illegitimate son, called Henry Fitzroy, by one of his early mistresses. The boy, born in 1519, was welcome proof to Henry that he could father a son – and that his lack of an heir was entirely Katharine’s fault. Even special physicians summoned from Spain could not help the queen to conceive again. And so, when More returned from a diplomatic mission to France in summer 1527, the king laid the open Bible before his favorite councilor. It was, Henry told him, proof that his marriage to Katharine was incestuous due to her previous marriage to his brother. It was unlawful before man and God and thus void. The king added that his lack of a legitimate son was clear proof of God’s displeasure. Was More surprised by this speech? We do not know. We do know that he tried in vain to support the king’s position. He read anything and everything he could find on the subject. In the end, he could not be persuaded. Katharine was the king’s true wife. He did not share his opinion with the king. And the king did not force the issue. Certainly Henry wanted More’s support. As England’s premier intellectual, More’s opinion mattered. It mattered to London shopkeepers, and to great churchmen. 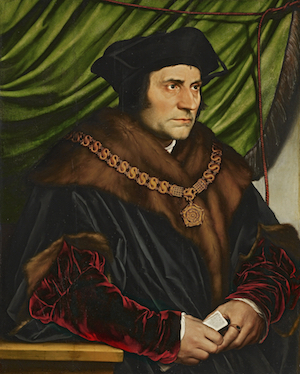 If the great Sir Thomas More believed the king’s marriage to be unlawful, why, it must be so! But if the great Sir Thomas More believed the king to be wrong? Henry was wise enough to state his case and let it go, – for a little while at least. And More was more convinced than ever that he needed to leave royal service. Unfortunately, Cardinal Wolsey was unable to secure an annulment for the king. The reasons were various, but the most important was Katharine’s position as aunt to the Holy Roman Emperor, Charles V. Charles would not let his aunt be cast aside (he was also considering the dynastic appeal of her daughter with Henry), and he pressured the pope to deny Henry’s petition. Wolsey, for all his brilliance and cunning, could not compete with that influence. And the king was now newly enamored of a young noblewoman called Anne Boleyn. His desire for an annulment was now not merely to secure a legitimate heir; it was also spurred by his desire to marry Anne. Anne’s personal religious feeling was unimportant. She was by necessity hostile to the Catholic church. They were preventing her marriage to the king. Likewise, Henry became understandably angry at the papacy’s refusal to repudiate Charles. Perhaps his earlier justification for the annulment had been a matter of self-interest, a selective interpretation of opaque text. But time and impatience had made him emphatic in his righteousness. It was perfectly clear to any objective observer that the marriage was unlawful before God! The king raged. He sent envoys. He dictated letter after letter. He badgered Katharine ceaselessly. Nothing worked. The pope would not relent. Meanwhile, time was passing and a king used to instant obedience was determined to wait no longer. Wolsey was destined to die for his failure to secure the annulment. Fortunately for the old cardinal, he died before the king could kill him. Unfortunately for More, Henry appointed him Lord Chancellor of England. The honor was tremendous; notably, More was the first layman to hold the office. He handled his responsibilities with his usual skill, but it was a balancing act, and an increasingly dangerous one. For example, as Lord Chancellor, More proclaimed the opinion of the English universities as favorable to the king’s annulment. But he himself did not sign the letter in which most of England’s nobles and prelates petitioned the pope to declare the marriage unlawful. And when the English clergy were forced to acknowledge Henry as the supreme head of their church, More attempted to resign his office. His resignation was at first not accepted. Henry still hoped for More’s support. But eventually the break between the king and his chief minister could not be ignored. More suffered a sharp chest pain, possibly angina, and begged the king to release him from his duties. This was on 16 May 1532, the date on which the archdiocese of Canterbury, as head of the English clergy, sent a document to Henry VIII in which is promised to never legislate or even convene without royal assent, thus making the king – a lay person – head of the spiritual order in England. Henry accepted More’s resignation. Their old friendship was past; the king’s new advisors were anti-Catholic and pro-Protestant, most notably among them was Thomas Cromwell. He had once served under Wolsey and knew More well. Cromwell was an astute politician whose beliefs changed at the whim of his royal master. He was even more aware than the king of More’s popular appeal; and this was to More’s detriment for it meant that his refusal to publicly support the king was not something that could be forgiven or forgotten. More would have to either acknowledge the king’s spiritual supremacy and marriage to Anne Boleyn, or he would die. That was clear to Cromwell almost from the first, and perhaps to More, too. But in the meantime, More had eighteen months of seclusion and study at his home in Chelsea. He lived in relative poverty, for he held no office and relied solely upon the hundred pounds per annum he collected from a property rental. He did not struggle with the reduction in means, and busied himself with planning a tomb for himself and his wives , as well as defending his faith in various pamphlets. He never explicitly courted controversy, but he felt compelled to answer the ‘reformers’ such as William Tyndale. His months of peace ended in 1533, when he refused to attend the coronation of Anne Boleyn. It was the Act of Succession, passed the following month, that sealed his fate. It stated that all who were called upon must take an oath acknowledging Anne as Henry’s wife and their future children as legitimate heirs to the throne. This More was fully prepared to do. Anne was the anointed queen. But – and of course this clause was added simply to trap More – the Act also required a repudiation of “any foreign authority, prince or potentate.” More could recognize Anne as the crowned queen of England. But he could not recognize the king’s authority as head of the new church of England. And so he was imprisoned in the Tower of London on 17 April 1534. More was not a man to be broken by prison, but he suffered physically. His spirits were high when visited by family and friends, though they were only permitted to see him if they took the Oath which he had refused. He encouraged them to do so. After several months, he was visited by Cromwell, but More refused to engage him in debate and merely declared himself a faithful subject of the king. In June 1535, after he had been imprisoned for over a year, Cromwell’s servant, Richard Rich, now solicitor general, stated that he had spoken with More and More had denied Parliament’s power to make Henry head of the church. This was an obvious lie; More had never said anything of the sort to any other visitor, – why Rich? And why such an obvious and clumsy admission? Despite widespread belief, even amongst Protestants, that Rich was lying, his statement was enough for a fresh inquiry to begin. It was then discovered that More had written to John Fisher, the bishop of Rochester, who was also imprisoned in the Tower for not taking the oath. This discovery resulted in removal of More’s books and writing materials. He could now only write to his wife and favorite daughter Margaret with a piece of coal or burnt stick on scraps of paper. On 1 July 1535, he was indicted on high treason. The resulting trial was mere show; despite his impassioned and brilliant defense, no one ever expected More to be found anything other than ‘guilty’. And so he was. He was sentenced to a traitor’s death – to be drawn, hanged, and quartered – but the king changed it to beheading. It was a small mercy. The story of More’s last days is terribly affecting. One does not have to share his religious convictions to appreciate his inner strength and noble character. He waited five days before being summoned to the scaffold on Tower Hill. “See me safe up,” he told the lieutenant who escorted him, “and for my coming down let me shift for myself.” He blindfolded himself and exhorted the assembled crowd to witness his end “in the faith and for the faith of the Catholic Church, the king’s good servant but God’s first.” Even More’s Protestant enemies did not believe him a traitor; his death was almost universally held to be nothing less than martyrdom. Erasmus mourned his friend and wrote that More’s “soul was more pure than snow” and his “genius was such that England never had and never again will have its like.” More was beatified by the Catholic Church in 1886, and canonized by Pius XI in 1935.